Relaxation and an abundance thereof is another one of my intentions. I cannot say that I am there yet all the time, though I was there yesterday. 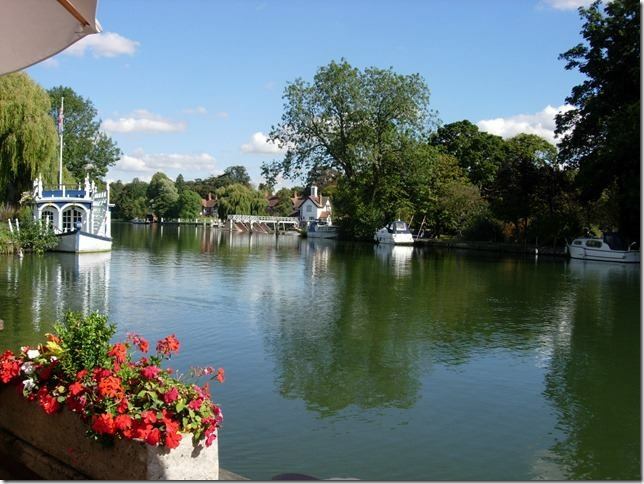 My friend and colleague, Marion, and I went for a day out to Streatley on the river Thames in Berkshire. We arrived early to avoid the crowds and began the day with an Earl Grey tea and iced coffee in the Deli. Then we retreated to a shady bench under a weeping willow tree where we sat by the boats, watching the ducks, with the sounds from the weir providing a delightful sound track to our day, a sort of creative white noise. We needed a creative sound track because we were brainstorming the content of the AbundanceFest day which is taking place in my South London garden on Sunday 10th August. It is one of the highlights of my Summer of Love offering giving new clients an extra basket of goodies including a day out/workshop in a tent in my garden, a luxurious 1-2-1 consultation with me on Skype, another day of financial coaching here, a private online forum and a handful of group telephone calls to keep us in abundant motion over the next two months. My aim is to encourage the delegates to feel grateful for all the abundance they have in their lives already, compare notes about what they do to create that now, such as it is, and find a way to have them in flow more often so that life becomes easier, happier and more relaxing too. Marion and I noticed, with the perspective you achieve when you are not sitting in your office – that the peace of single-tasking for a whole day brought forth loads of abundance for us both. An abundance of ideas, and laughter and happy times. An abundance of sunshine and smiles. Lots of boats, millions of pounds’ worth of boats just littering both sides of the river bank. Flotillas of ducks swimming leisurely and yet with military precision in their formations and lots and lots of people having a lovely day out, messing about in boats, not to mention a luxurious treat of a lunch in the restaurant. Mine was fish & chips, which was singularly inappropriate given the boiling hot weather. Travelling home we considered the abundance in our own lives and challenged each other to manifest more of what we want and less of what we don’t, to give up sweating the small stuff and energies like force, fear, control, perfectionism and lack. We played with ideas about what abundance means to us personally and, of course, it is very individual. Our own abundance bore examination and we unearthed lots of thoughts and feelings about how we would like the next period of our lives to be, on the cusp of adventure. And so it will be for our delegates too on Sunday 9th August. With thanks to The Swan at Streatley for a lovely, relaxing day. I have borrowed this image from their website; look how lovely it is there! If you’re going, tell them Marion and Judith sent you. And if you’d love to join the AbundanceFest2014, there’s still room for a few little ‘uns on top. Talk to me, People, and come on over.